Part of Rexel’s award winning range of automatic shredders, the Rexel Auto+ 200X Cross-Cut Shredder is designed for small office use and will shred up to 200 sheets of 80gsm paper at a time. With the Autoplus, you simply load the shredder and let it automatically shred your documents - there is no need to remove staples or paperclips and no need to stand and keep feeding paper in! Instead, you just stack, shut and go. The Rexel Auto Plus 200X Shredder has a P-4 security rating, shredding each A4 sheet into approximately 200 4x40mm pieces. This shred size means it is suitable for highly confidential shredding, great for a small business or organisation. Rexel recommend the shredder for up to 10 users and the 32 litre bin will hold up to 325 shredded sheets. The bin has a viewable window so you can see how full it is getting and in addition to paper, you can also shred credit cards and CDs/DVDs. 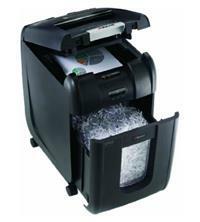 Other features include: a 7-sheet manual bypass slot if you only have a few sheets to shred and don’t need to use the automatic option; thermal overload protection and cool down indicator; door open and bin full indicator; auto sleep (after 2 minutes non-use) and wake modes (the shredder automatically wakes from sleep mode when paper is inserted into the shred mouth); automatic jam clearance and manual reverse to help clear any paper jams; separate CD/DVD waste tray to collect CD shards and ensure they don’t mix with paper waste (good for recycling); self-cleaning cutters; and castors so you can easily wheel the shredder around the office. The Rexel Auto+ 200X Cross-Cut Shredder comes with a 2 year warranty on the machine and 10 year warranty on the cutters.